The Delaware Valley Water Garden Society is an organization of volunteers dedicated to water gardening and pond keeping. Our members range from novices to commercial professionals. Membership brings together water gardeners from southeastern Pennsylvania, New Jersey, Delaware, and Maryland. To foster interest in the culture of water gardens. To educate our members about aquatic plants and ornamental fish. To develop fellowship among water gardeners. To promote interest and aquatic education. To interact with other organizations with related interests. DVWGS holds meetings and events from January to November. Events are announced in our newsletter, by email, and on this web site. We publish a DVWGS newsletter regularly from January through November. 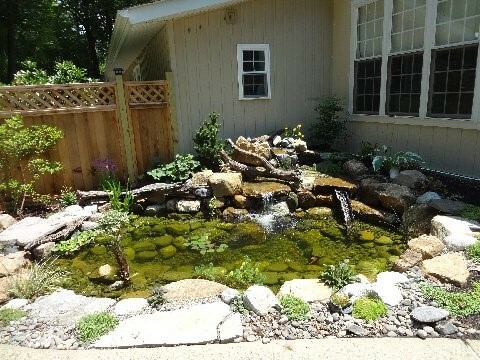 It is filled with articles and information on programs designed to make your pond-keeping life more enjoyable. This web site includes useful articles on pond management. DVWGS pond expert, Bill Fogel, runs the DVWGS Pond Help Line (610-687-3105) for members who have questions about fish and pond health. Check our event calendar regularly for new events. Sign up to receive timely details via email. Join our FaceBook group for the latest news, photos and announcements. Download our membership brochure (PDF) for more information. To participate in all future DVWGS events, Join or renew today! You can make a secure payment of your membership dues via PayPal.